It’s been more than half a century since Eau Claire last saw passenger rail service. If the turnout at a Thursday evening hearing was any indication, there is strong interest in making sure another 50 years don’t pass before the trains run again. 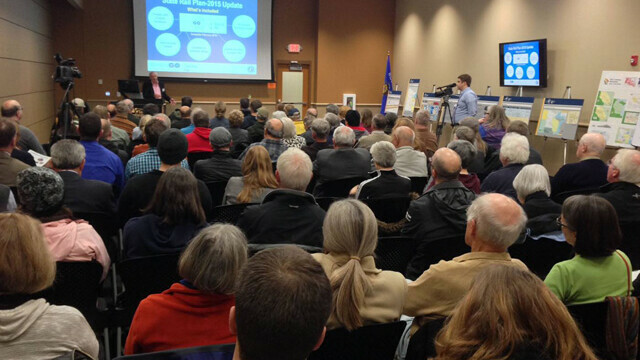 A standing-room-only crowd of more than 100 people, from 20-somethings to seniors, attended a Minnesota Department of Transportation open house at Chippewa Valley Technical College to hear about the neighboring state’s passenger rail plan, which includes a potential line between Eau Claire and the Twin Cities. The desire for such a route was identified when Minnesota created its state rail plan in 2010. Now, the Minnesota DOT is preparing a five-year update of that document. The rail line is envisioned as offering speeds up to 79 mph (and perhaps as high as 90 mph) between Eau Claire and the Twin Cities, with stops in both St. Paul and Minneapolis. The 2010 plan included four round trips a day on the route and estimated passenger demand of between 100,000 and 300,000 riders annually. But making the route a reality will take collaboration, political will, and – most of all – money. “This is a bi-state project,” Praveena Pidaparthi, planning director of MinnDOT’s passenger rail office, told the gathering. “We cannot advance this project just based on MinnDOT findings. We need WisDOT’s cooperation too to advance this. And I think we need that grassroots initiative, which we already have” – in the form of the West Central Wisconsin Rail Coalition, one of the event’s sponsors. Furthermore, the project needs to reach the stage of planning where funding can be found within the two state budgets’ and from the federal government, Pidaparthi said. After President Barack Obama took office in 2009, billions of dollars were available from the federal government for rail projects. Now that money is gone, but states like Minnesota want to be ready with their plans if and when new federal dollars become available, Pidaparthi said. Currently, the transportation departments in Minnesota and Wisconsin aren’t actively collaborating on a Twin Cities to Eau Claire route, planners said. 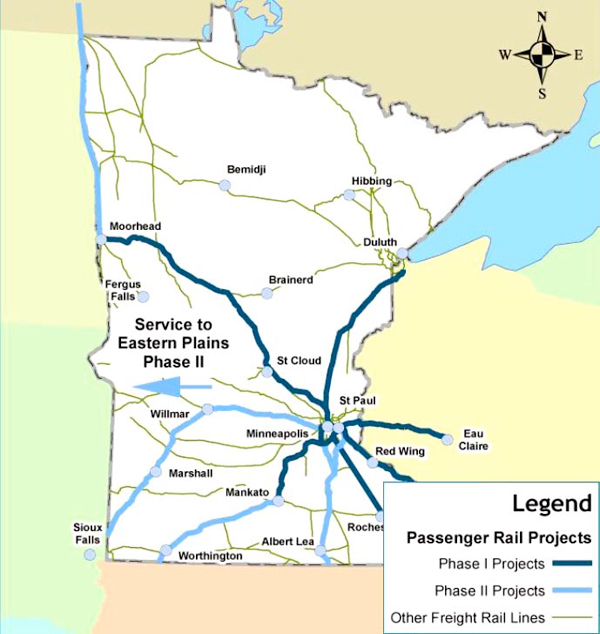 While the Eau Claire route is considered a “Phase I” project in the Minnesota rail plan, the document’s Wisconsin counterpart – which was adopted earlier this year – only includes Eau Claire service on a list of long-range plans. “Wisconsin is talking about additional passenger rail development, but only on the existing routes,” said Scott Rogers, chairman of the regional rail coalition and government affairs director for the Eau Claire Area Chamber of Commerce. Among those existing routes is the long-distance “Empire Builder” Amtrak line that traverses Wisconsin and Minnesota on its way between Chicago and Seattle. Wisconsin and Minnesota are working together to explore adding a second daily Empire Builder train. Eau Claire County Board Member Jim Dunning asked whether the states had considered running the second Empire Builder on a route that took it through Eau Claire instead of La Crosse, where the current line travels. Dave Christianson, project manager for the Minnesota rail plan, said that they were only looking to add a second train on the existing route. As part of the plan update, the Minnesota DOT will be recalculating ridership and cost estimates for the proposed Eau Claire route. Previously, the rough cost of upgrading the existing rail line, buying trains, and building stations was pegged at $500 million, Christianson said. There are no current estimates on the operating cost for the line, or what ticket prices would have to be to sustain it, Christianson added. “We could price it at $1 million and hope for one rider,” he quipped. Estimates made in the 2010 plan that railroad traffic would grow steeply have proved accurate, Christianson said. However, much of the growth has come in freight rail traffic – including trains loaded with oil and coal coming from the West through the Midwest. This increased freight traffic has been to the detriment of passenger rail, because both kinds of trains travel on the same rails, he said. Minnesota’s draft rail plan will be finished in November and December and submitted to federal officials in February. After that, Minnesota DOT planners will make a return tour of Eau Claire and other cities for follow-up meetings. After the open house, Rogers – the local rail advocate – said he was pleased to see the large, supportive turnout, and he expressed optimism that passenger rail will return to the Chippewa Valley – eventually. National trends and demographics are working in favor of rail transit, said Rogers: Millennials are less likely to want to drive and aging baby boomers still want to travel but are nearing the age where driving becomes more difficult. “We are seeing across the country where there are train services, people are using them,” he said. To learn more about the Minnesota State Rail Plan or to comment on it, visit www.dot.state.mn.us/aboutrail/ and follow the link. For more information on grassroots passenger rail initiatives in the Chippewa Valley, go to westwisconsinrail.org. And to hear a podcast of the Eau Claire open house courtesy of Chippewa Valley Community Television, visit www.cvctv.org.